Tomato and peanut sauce is typically found all over Brazil, though this recipe is a tribute to Espírito Santa – a little neighbourhood restaurant that lies above the beaches of Rio. 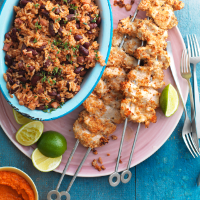 Its stand-out dish is chicken skewers rolled in chopped nuts, which inspired this recipe. 1. Preheat the oven to 180°C, gas mark 4. Put the brazil nuts, cashew nuts and peanuts for the sauce in separate corners of a baking tray and bake for 8-10 minutes, or until lightly toasted. Remove and leave to cool. Set the peanuts aside. Rub the brazil nuts in a clean tea towel to remove their skins, then put in a food processor with the cashew nuts. Pulse into crumbs with a few larger chunks. Tip into a shallow bowl and set aside. 2. Next, make the tomato and peanut sauce. Melt the butter in a small pan and add the onion, garlic and ground coriander; season. Cover and cook over a medium-low heat for 6-8 minutes, stirring occasionally, until soft and translucent. Stir in the rest of the sauce ingredients, including the toasted peanuts. Simmer for 8-10 minutes, or until the sauce has thickened. Transfer to the food processor and blend for 1 minute, until smooth; season. Return to the pan, ready to reheat before serving. 3. For the chicken skewers, slice the chicken into 2cm strips. Lightly beat the egg and season with the salt and pepper. Coat the chicken strips in the egg, followed by the toasted nut crumbs. Thread the coated chicken onto metal skewers (or wooden skewers, soaked in hot water for 15 minutes first) and place on a lightly oiled baking sheet. Drizzle with a little olive oil and bake for 15-18 minutes, until firm and just cooked through. Serve with bowls of tomato and peanut sauce for dipping and some lime wedges for squeezing over, if liked.